One of the awesome perks of being a SweatPink Ambassador is the opportunity to review some great products and also to share them with you. Today I want to share about MealEnders, what they are, how you use them and my honest review. 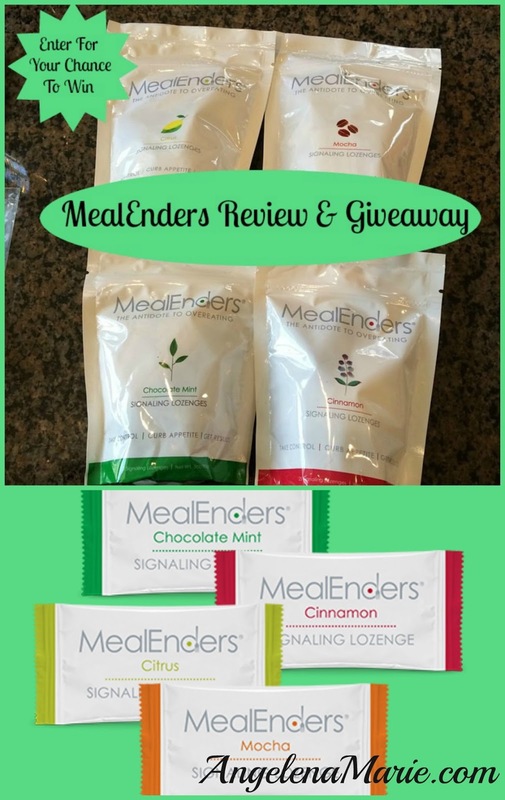 The folks at MealEnders will send 4 full size bags like the ones shown to one of my lucky readers so you can experience the goodness of MealEnders. When I first got the e-mail about trying out this product I have to say I was intrigued by the description. It is a signaling lozenge that helps to stop overeating and mindless snacking. It is designed to be a weight loss tool. I like that they are designed to help with a few things that I myself struggle with. They are the first ever product of their kind and don't contain any drugs or stimulants, pretty cool if you ask me. They are designed to work with the body's natural hunger rhythms helping you to stop mindless overeating that may be causing you not to reach your weight loss goals. When you are full at the end of a meal, but are tempted to go back for seconds or reach for or order dessert now is the time to pop a MealEnder lozenge, and yes they are individually wrapped so you can keep some in your purse. There are 4 different flavors so you can choose which flavor you are in the mood for. They have 2 layers, the outside layer is sweet like a dessert and the inner layer is a cooling/tingling inner core. The first layer is to signal the reward portion, like a dessert would do. The inner core signals your trigeminal nerve (the nerve that senses taste sensations in the mouth) with a cooling/tingling sensation that tells your taste buds that you are done with the meal and it cleanses your palate. This helps you transition from eating the meal, which can help stop overeating. I like the cooling and tingling sensation, it feels like you brushed your teeth and you really don't want to eat right after you brush your teeth, everything tastes a little off. When you use MealEnders at the end of each meal you are also creating a habit that once you have your signaling lozenge that you are done eating. This helps to create mindfulness with your meals and can end the cravings for sweets after a meal and helps you stop overeating. You can use MealEnders as many times during the day as you need. You can use them right after each meal and in between meals when you feel a craving for sweets coming on. You can use them at a restaurant to keep you from overeating or ordering dessert. They would also be great to have on hand at parties where they will be food out and you don't want to stand around mindlessly snacking. The times I used them the most is at night when the cravings to sit and snack while I am watching TV hits. The first thing I want to emphasize is DO NOT CHEW THEM! That got your attention right? They are meant to be savored and melt in your mouth, this helps give your brain time to catch up with your stomach and your mouth is occupied which keeps you from eating more than you want. They are best used consistently and in conjunction with proper diet and exercise, as they are a weight loss tool. I love them! I was excited to get them and start using them. During the day I usually am busy so I don't have the urge to sit around and snack. It is at night after dinner that I want something sweet. Then later while the hubby and I are watching TV I feel like snacking. In both of these instances I popped a MealEnder instead and was satisfied. It allowed me to move on from the craving that I was having. I will also pop one here and there throughout the day if I feel like I need to get my mind off of food (which is a lot, hehe). There are four flavors: Chocolate Mint, Cinnamon, Citrus and Mocha. My favorite was the Mocha because it tasted like sweet coffee and left a hint of that flavor in my mouth which I enjoyed. Second was the Chocolate Mint, because hello chocolate anything is good, followed by the Cinnamon and last was citrus...can you tell I'm a sweets girl! I liked to mix up the flavors on different days, it kept me from getting bored with just one flavor. I also keep some in my purse for when I am on the go or out to eat. I like it because if you are with friends it just looks like you are having an after dinner mint. In my opinion these are a wonderful addition to any weight loss program and can help you if you struggle with overeating and mindless snacking. I would recommend them to my clients, friends and family to help in their weight loss journey. Thanks MealEnders for coming up with a great product that can help those struggling! Get em while they're hot...you can buy MealEnders right on their website: MealEnders.com. Right now you can enter to WIN a bag of 4 MealEnders, one of each flavor. Just follow the prompts on the giveaway! Good Luck and I will announce the winner next week!